The world's first fully certified biodegradable and compostable plastic doggy-doo bags. Unpackaged bundle of 50. The world's first fully certified biodegradable and compostable plastic doggy-doo bags. Made primarily of cornstarch. Bundle of 50 bags without packaging measuring 30cm x 19cm each. 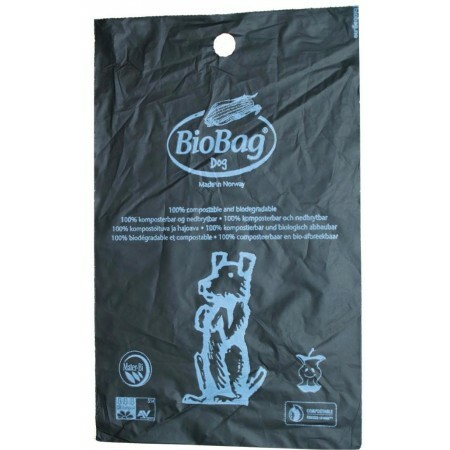 Using biodegradable bags to dispose of your pet's biodegradable waste makes good sense. To avoid misleading claims and be sure that the bags you purchase will actually biodegrade rapidly and safely, look for independent certification. These dog waste bags are fully certified to EU OK Compost and US standards to be 100% biodegradable and 100% compostable. They contain no polyethylene. You may be aware of debate over 'degradable' plastic bags, which are polyethelene bags with a percentage of plant starch or additives. These bags break down into pieces of plastic debris that do not compost. Certified by the Biodegreable Products Institute (BPI) and DIN CERTCO. Made of a material called Mater-Bi, the main component of which is cornstarch. The bag is completely biodegraded after 10 - 45 days depending on the method used. I doubled these up, especially if my dog's leavings weren't as solid as i'd hoped, or if there were leaves/twigs underneath/if the leavings were more plentiful than expected. They were strong and helped to stop much smell from escaping. I don't mind the lack of handles, but handled versions are available if they're a must for you. these poo bags are a great strength and a big enough to use with a big dog! I used these to scoop cat poop. Great alternative to other kinds of plastic.